the name of the band, sigur rós, is actually the name of jónsi's little sister, except it's spelled sigurrós. she was born at the same time as the band formed. sigur rós translates to 'victory rose'. trivia from the album ágætis byrjun: the strings in starálfur are palindromic; they are the same forwards and backwards. the album's intro is a chapter from the title track, ágætis byrjun, reversed. avalon is a chapter from starálfur, slowed down. the band originally intended to record ( ) in a disused nato tracking base in the northernmost mountain in iceland, but after inspecting it decided it was too unpractical. shortly after they found an abondoned swimming pool lot in a rural neighbourhood in iceland called álafoss. the band bought the lot and transformed it into a studio, where they recorded ( ). to get their massive mixboard in the building they had to open up a part of the roof and lift it down with a crane. bassist georg is occasionally refered to as 'white fang' after his ability to catch trout with his teeth. drummer orri is nicknamed 'the animal' because his father's name is dýri, which means 'animal'. the first song sigur rós recorded for the ágætis byrjun album was (shock!) ágætis byrjun. when they finished the song, they played it to their friend who really liked it and said it was an "alright start" (= ágætis byrjun), so they named the album after that. viðrar vel til loftárása (from ágætis byrjun) means 'good weather for an airstrike'. once, on icelandic tv during the war in kosovo, a weatherman ironically said that 'í dag viðrar vel til loftárása' ('today is good weather for an airstrike'). sigur rós named the song after this. in 1995, jónsi fronted a band called 'bee spiders', under the alias 'jonny b' (a hidden reference to 'jón birgisson'). kjartan was also an occasional member of the band, serving as female background singer (tina turner style). jónsi wore sunglasses onstage throughout the whole concert. 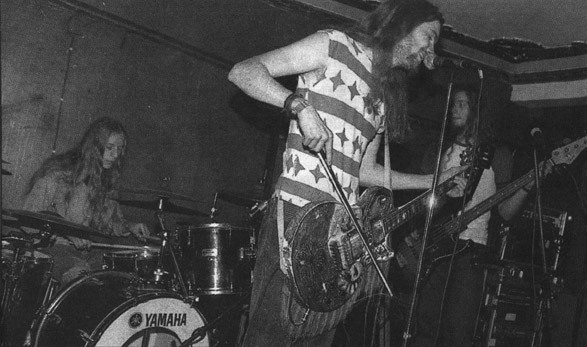 bee spiders received the 'most interesting band' award in 1995 in a contest for unknown bands called 'musiktilraunir' (music experimentations), in which kjartan appeared in drag, in keeping with the female background singer idea. the band played long rock songs and were compared to the smashing pumpkins. jónsi also fronted a grunge rock band called 'stoned' around '92-'93. much about sigur rós is coincidental.. for instance jónsi being the singer and him using the bow on the guitar.. ágúst (the former drummer) got a cello bow for his birthday and georg started "torturing" his bass with it (it sounded horrible) and then jónsi tried it on his guitar (which sounded better). jónsi has used the bow since at every concert. jónsi became the singer because no one else could sing. the cymbal in ný batterí is a cymbal that they found on a street downtown that was bent and had apparently been driven over. they liked the way it sounded and wrote the song from there. sigur rós have an impressive celebrity fan base. celebrities that have either attended sigur rós concerts or raved about them in the press include brad pitt, madonna, tom cruise, gillian anderson, jason lee, tommy lee, natalie portman, david bowie, björk, moby, and bands such as metallica, red hot chili peppers, bush, coldplay, foo fighters, rage against the machine, no doubt and radiohead. sigur rós recorded their first song, fljúgðu, in six hours. this song can be found on the downloads page. for their first album, von, sigur rós painted the studio they recorded it in, in exchange for recording the album. the band's production of the first album, von, was a very long one and in the end, the songs sounded completely different from the original recordings. the band considered scrapping the final result and starting all over again, but decided not to because this would have taken much too long. the last song on von's remix album, von brigði, is a song by sigur rós which was supposed to go on von but couldn't be finished in time, so they put it on the remix album instead. this song, called leit af lífi, can be downloaded in the media section. their first album is entitled von, which means hope. their following album was a remix album of von, called von brigði, which means disappointment. cunningly, the world 'tilbrigði' means 'alternative version'. the third album, ágætis byrjun, means 'a good beginning'. the last lyrics of the album are 'we sit down excited, listen to ourselves play in rhythm to the music / but the sound wasn't good / we were all in agreement / we will do better next time / this is a good beginning'. these lyrics refer to the band's listening to von upon its completion, agreeing that the next album they make (ág�tis byrjun) will be better. all of the band's three music videos were originally meant to be for different songs but split decisions were made before shooting to change to different songs. the svefn-g-englar video was originally meant for viðrar vel til loftárása, the viðrar vel til loftárása video was originally meant for starálfur and the vaka (untitled #1) video was originally meant for njónsavélin (untitled #4). the producers of the david letterman show offered the band 3 minutes to play on the show in early 2001. the band declined because of the short time slot but were offered them a comprimise of 4 minutes. this time slot was was still far too little for the band, whose songs average on 7-8 minutes. [you can read an interview with jónsi, in which he talks about the letterman matter, here.] the band has performed at two other american talk shows who have given them more time: the late late show with craig kilborn in december 2001, and last call with carson daly in march 2003. both performances can be downloaded on the video page. sigur rós assembled and glued together the cases of the first print of ágætis byrjun themselves. this resulted in many of the cd's being unusable due to glue stains on them. all sketches on ágætis byrjun were done with a bic ballpoint pen. singer jónsi has been blind in one eye since birth. the first song jónsi learned how to play on guitar was wrathchild by iron maiden, at the age of 13. iron maiden remains one of jónsi's favourite bands today. orri's favourite band has been black sabbath from an early age. the members of the band don't all have the same taste in music but they all share a great adoration for leonard cohen. in 1997, the band adopted a hippie appearance, started wearing hippie clothes and grew long hair and beards. this picture is from a concert in reykjavík in late 1997.
in june of 2000, sigur rós made an unannounced surprise appearance at a small music shop in reykjavík under the alias band name 'whm'. insiders have later revealed that this abbreviation stands for 'we hate music'. you can read a review of this secret gig here.